Enjoy homemade vanilla pudding like grandma used to make! This easy comfort-food recipe is sugar-free and perfect for any low carb and ketogenic diet. It’s been overcast the last few mornings; a bit of “June Gloom” in September delivering just enough cool respite to turn my thoughts to Fall. For those of us living in Southern California, often dubbed “paradise”, the constancy of our weather never gives us pause. We can count on clear blue skies almost every day (and where I live, daily temperatures in the 90’s – 110’s during late Summer and into Fall). So, it’s the absence of blue skies that makes for an interesting morning – like this morning. Because we basically live in the desert, we find our evenings deliciously cool with a night-time inversion that brings with it ocean breezes perfect for growing grapes and taking walks! It’s this time of the year we take “family walks” after dinner. We just leave the dishes where they are and walk around the neighborhood and local park talking about school, commenting on our neighbor’s landscapes, and greeting any folks we may encounter along the way — and perhaps catching a few Pokemon! It’s always nice to come home to a simple dessert and what can be more simple then a homemade vanilla pudding? 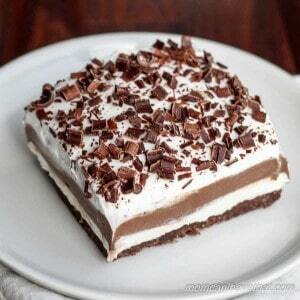 If you’re like me, you like simple desserts. 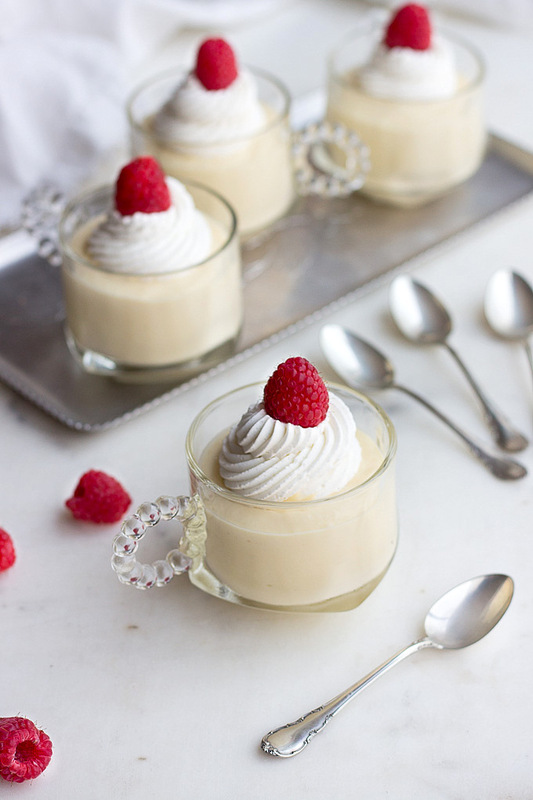 Don’t get me wrong… I love fancy birthday cakes and delicious ice creams, but there’s nothing more comforting than a nice homemade vanilla pudding. My Nana used to make homemade pudding – this is well before the days of instant pudding and the craze of desserts based on boxed cakes, boxed pudding mixes, and Cool Whip. The women of my Grandmother’s time made their pudding with cornstarch, milk, sugar, and eggs. They cooked it on the stove and always got it right. There’s really nothing to it! 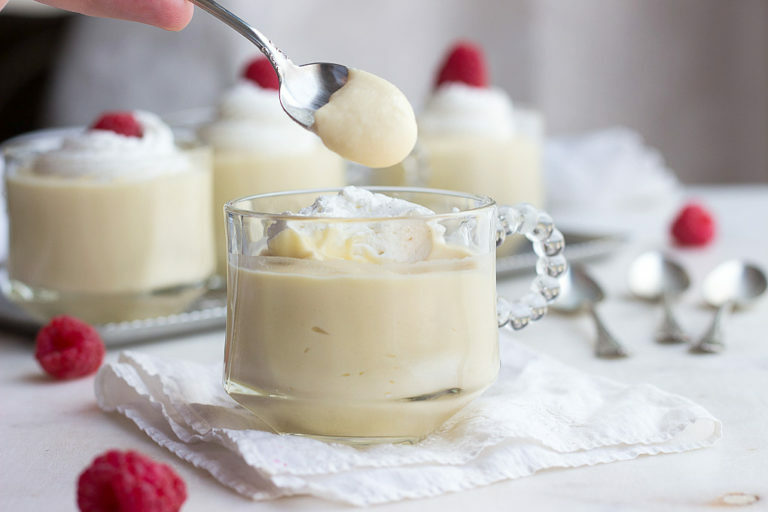 This low carb vanilla pudding recipe uses heavy cream and almond milk, eggs, gelatin, and a low carb sugar substitute to achieve it’s creamy goodness. It takes about 15 minutes to make but needs several hours of chilling time. It’s sugar-free but it’s luxurious texture won’t leave you wanting for more… It’s a deliciously satisfying, comforting treat! This creamy Low Carb Vanilla Pudding is net carbs per serving! Bring the heavy cream and almond milk to a simmer in a small pot over medium heat. Place the dry ingredients (erythritol, cornstarch, and salt) into a medium heat proof bowl and whisk together. Add the egg yolks and whisk. Whisk in the whole eggs. Ready the sieve near the bowl. Sprinkle the gelatin over the tablespoon of water. Continuously whisk the mixture for the next 5 minutes, until it begins to thicken all-at-once. Turn the heat down a tad and continue to whisk for 1-2 minutes. The mixture should very slowly simmer if whisking is stopped. Remove from heat and whisk for 1 minute more. Place the sieve over the bowl and pour the pudding through the sieve to catch any bits of egg that may have cooked. Whisk in the butter, vanilla, and stevia glycerite. Taste and adjust sweetness per your liking. Add the gelatin and whisk again until it's completely melted and incorporated. Cover with plastic wrap by pushing it right down onto the surface of the pudding. Chill at least 8 hours. Before serving, whip the pudding with a hand mixer so it is lighter in texture. Serve. Hi Kim! I just made this pudding, and tasted it warm before I popped it into the refrigerator! So good! I’m so excited, I’m going to use it as a part of a gluten-free, low carb-ish trifle. My oldest daughter would request a french vanilla, fruit trifle every year for her birthday. once my youngest daughter was diagnosed with celiac, and we are more carb conscious, I haven’t made it. I’m so excited to give it a try! Thanks for always being my go-to for delicious recipes. That recipe looks great! I love those little tea cups—where did you get them? This recipe is amazing. I didn’t use the cornstarch as I didn’t have any. It still turned out great! I had to have a few bites before I even put it in the fridge. Thank you Kim! Thank you for this recipe! I like to make low carb eclairs, but most of the filling recipes are made with heavy cream, eggs and butter, and they are too heavy and greasy. This looks perfect! Also, I’ve just bought almond milk for the first time, so that will greatly increase my recipe file. I’m all for keto, but LCHF works best for me, since it’s not “a sin into death” if I eat a half of a potato or a slice of bread once in a while. Yes, you lose weight slower, but you don’t feel so deprived. I use verbalize flour white a bit, which is no more expensive than but flours, and gives more normal results of you are a little sweetener to the recipes, to disguise the slightly strange taste. But now I’m babbling…thanks again! 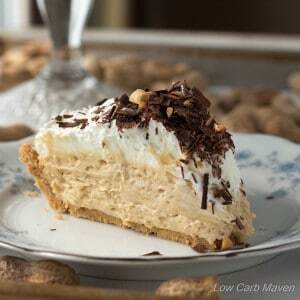 One Tablespoon of Cornstarch is 7grams of carbs, adding just over one gram of carb to each serving in this recipe. So still keto, yay! Would adding about 3tbsp of cocoa powder to this mess with it? I look forward to trying it either way. I thought corn starch wasn’t keto? We ate this today and it was really good! I must say your photos are gorgeous, too! It did sit in the fridge for 36+ hours before served. I did whip it up and add a little cream before serving, although the texture was not as smooth as how it looks and it was a tad grainy. I’ve been making numerous pudding and jello recipes (teens w’ wisdom teeth extractions lately) and I might try this again to get the texture right! 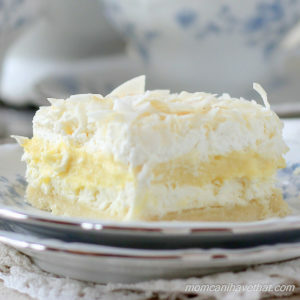 Love these desserts and signed up for your newsletter. I can’t find zantham gum. Any suggestions? You live in a DESERT. ? Craving vanilla pudding right now! Great post – I think, I’ll try this tonight. Perhaps cornstarch could be replaced with Gluccomannan / Konjak? Not about the carbs, but I really can’t have starches. Yum1 Can’t wait to try this during my first #KetoOn holidays! Thank you! Your pictures are beautiful Kim! This pudding recipe looks rich, lucious, and lovely. I can’t wait to make this. A walk in the cool breeze sounds amazing! I live in Western Montana – it gets hot in the summer, but always cools off at night. I love it! The puddings look delicious! Oh, I do love a good vanilla pudding. When I was a kid, we used to eat it with hot berry sauce. This looks absolutely delicious. Thanks for sharing! 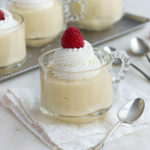 What a lovely vanilla pudding recipe and such beautiful photos. Very versatile too. Ah, memories of our Nanas! My grandmothers were born in the late 1870’s, so they definitely didn’t have access to any instant puddings. Only 23 carbs for your pudding? I’ll have to give this a try! I haven’t tried it yet but it looksgreat! I know it’s 3 carbs per serving but how much is one serving?